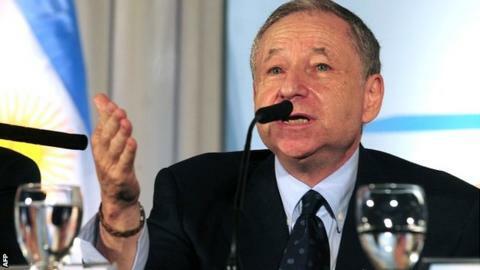 FIA president Jean Todt will stand unopposed for re-election next month after rival David Ward withdrew as a candidate. Todt, 67, succeeded Max Mosley as the governing body's president in 2009. Ward was critical of the Frenchman and in August resigned as director-general of charity the FIA Foundation after 12 years in order to stand against him. But in a letter to FIA member clubs, the 56-year-old Briton explained he had been unable to gain sufficient support. Jean Todt was supported by former FIA president Max Mosley, F1 chief Bernie Ecclestone and seven-time world champion Michael Schumacher when he ran for the FIA presidency in 2009. "It has not proved possible for me to secure the required number of regional vice-presidents for sport to ensure the eligibility of my list," he wrote. "I, therefore, would like to offer my congratulations to Jean Todt who will secure a second term uncontested if not unopposed." The FIA is the governing body for world motorsport, with responsibilities including both Formula 1 and the World Rally Championship. The election will take place at its General Assembly meeting in Paris on 6 December. Friday is the deadline for entering a candidate list, with Ward failing to secure the required backing of 26 FIA member clubs and seven vice-presidents for sport. "The use of support agreements in advance of the election makes it very hard for any candidate to obtain the required vice-presidents for their list," Ward added. "In the FIA's North American region, 11 out of the 12 clubs signed an agreement to support Jean Todt in March. This left only one club available to provide a vice-president for my list. "Clubs from the region that are sympathetic to my candidacy would have to break their previous pledge of support. It is understandable that they have been reluctant to do so."